Greetings, PlayStation Nation — and happy start to your summer! We have a bunch of great gaming stuff to talk about, so let’s get started. 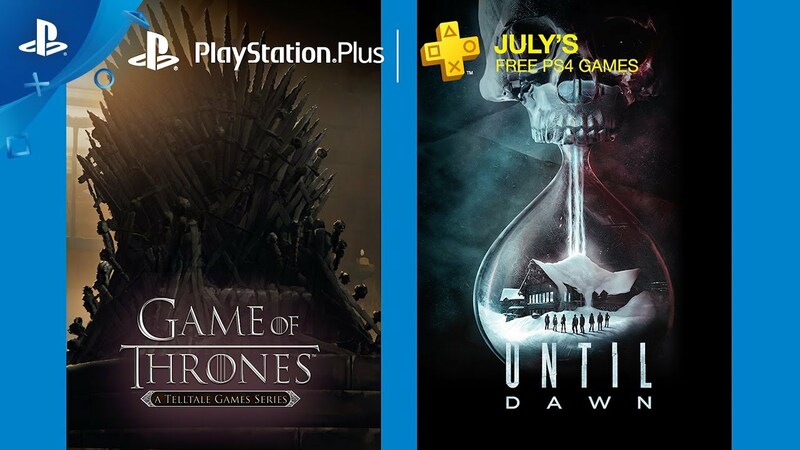 First off, the free PlayStation Plus games for July are Until Dawn and Game of Thrones. Joining the fun is easy: all you need is your smartphone or tablet and the free companion app. Snap a selfie and enjoy tons of funny questions, texting games, and drawing challenges. Finally, Orcs Must Die Unchained is launching on July 18. As a PlayStation Plus member, not only will you get access to the game, but you’ll get an exclusive Orcs Must Die Unchained Plus Pack as part of your membership. The $20 pack is only available until August 15, so get it while you can. Holy hell, Until Dawn. Fantastic, great game and lots of fun. Yeah Japan’s line up is way better. These games look like trash. Sony, this is by far the best month. Absolutely great offering. For anyone who has not played Until Dawn, it is a great game. Yep.. so happy to see Until Dawn there. I was bummed out when I realized it wasn’t in the ‘mid year sale’, but this is so much better. You do realize that people have been using PS Plus for years for just the games right? I am not being ungrateful but it’s unfair.Asia getting better games like JUST CAUSE 3 and we are getting simple games. Either gives us better games or give all of the stores the same free games. Exactly! Until Dawn is a ton of fun and got loads of replayablity. Too bad I already own it, but it gives me an excuse to replay it and get a different ending. Anyone that likes cheesy 80/90’s style horror flicks should play it. I would like that Sony would let us choose between which games do we want each month. That would be a good change. For game of thrones it’s only season 1. Or am I missing something? pantera143, look at what you just said, keywords;paying to play online. SenorDerp911 paying $60 a year to play online comes out to $5 a month, not $10. How many other things do you spend $5 on in a month? That’s less than a fast food meal, less than a coffee shop coffee. It’s a fraction of an hour’s worth of pay (if you have a job). In fact it’s cheap. As for what it costs to run a server, businesses are in business to make profit, they aren’t charities. But if that $5 a month is too steep for you, you can choose not to pay it. No one is forcing you to subscribe. Most games work just fine without the PSN subscription. Please stop with the adventure games on PS Plus for PS4. That’s essentially 5 in the last 3 months. Please vary the genres a bit more. Well whatever term you want to use to describe interactive games that focus on the experience and minimize gameplay and challenge. Superline51, the Game of Thrones game included in this list is an adventure game. That having been said, that still a pretty dumb complaint to make, all things considered. Why is it dumb? I’d prefer more variety in the Plus lineup. For one thing, there is more than one game every month. For another thing, there are other genres that get repeated far more often than adventure. Not recently. Gameplay-lite, experience-focused games have been dominating the core PS4 PS Plus games for the last 3 months. What the heck is wrong with wanting a variety in genres? Man, the antagonistic responses to any consumer feedback on these is nuts. I was assuming it was the Telltale version of GoT. God, what a spoiled child you are. Would you rather we go back to getting retro indie platformers again? This is a great lineup and if you can’t appreciate it, you should be ashamed of yourself. And it is the Telltale game, not the PS3 Game of Thrones adventure game. We just got Killing Floor this month. I still do not see how wanting more Variety is a issue. Killing Floor 2 is awesome, already got it on PC however so it just sits in my library, was hoping Darkstalkers Ressurection would of had the Ps4 tag next to it, but I was gravely mistaken. all in all the Line up this month is not bad, but wouldnt mind seeing some more things outside of the Telltale series, I Already get enough of that on line ups here on the PSN and, Xbox Live. Not bad games by any means, but good for one playthrough then done. I know we got Killing Floor 2. That’s the only game in the last 3 months out of the highlighted PS4 games that hasn’t been an adventure game. The other 5 all have been. And I like retro indie platformers. I don’t want all the games to be indie platformers, just like I don’t want all the game to be adventure games. You know you can just go out and buy whatever game you want. Agreed. Where are the RPG’s? I don’t have a problem with these type of lite-gameplay games but they HAVE been dominating the Plus lineup, Life is Strange and Tales of Borderlands as recent examples. Need an edit function here. Gravity Rush Remastered like Japan would’ve perfect to drum up interest in that series with GR2 out. Never thought about that Ziggadala. What a novel concept, I’ll consider it! Superline51, The Telltale games are basically adventure games. They don’t really have the puzzle solving elements like the more traditional ones, but that’s still basically what they are. Games like Monkey Island, Full Throttle, Grim Fandango, etc. Until Dawn sorta of fits as that style of game, too. It just has more of an emphasis on choices. I never really consider these as Adventure games. When I think of the adventure genre, I think Uncharted, Tomb Raider, Shadow of Mordor, or The Last of Us (mostly Survival, but still an adventure). Games like Until Dawn, Life is Strange, and Tell Tale games in general, I considered those as Storytellers. True, we do need a little more variety in the line up, but compared to what they have been giving out lately, these are excellent titles. You’re getting a free game, stop complaining. This service isn’t free, don’t be a boot-licker. You kids are never satisfied no matter what they do. We want free stuff when all we are doing i paying for server upkeep and online play. Ya! free games. Now Oh god so and so got so and so, oh my god it’s not the genre I want. Either stop looking for handouts or buy what you want. These games are not ‘free’ any more than Netflix gives you ‘free’ movies. It is a paid service. Consumer feedback is normal. Ha, got to love all of these people who rail against anyone who gives consumer feedback. Like all of this nonsense about how people will never be satisfied, or how they expect too much because it’s “free”. Yeah, sorry it’s a paid service which has had a noticeable decline in quality since the shift to PS4. They had to actually provide value to the service on PS3, because online play was free. But now since online play is tied to PS Plus, and that’s why most people get it, there’s no longer any real incentive to bring out a lot of AAA games. +1 Ratburn, Tacad and jaratee. Some people just don’t have such basic logic skills. Duh… I know it was only for games once how ever I play online quite a bit for both reasons. jds07, they just are adventure games. They’ve been called that for literal decades. I didn’t name the genres, it’s just what it is. Games you mentioned, like Uncharted, are third person shooters and/or action games. Seen them referred to as action-adventure on occasion, but never just “adventure.” If you say “adventure game” most people that have spent any time playing games are going to immediately think of games that have been traditionally called adventure games. Old Lucasarts games, Sam and Max, current Telltale stuff, etc. And, for the record, I have no real problem with the July games other than I’ve already played Until Dawn and don’t really have a need to play it again. It’s a great game, though. I was just agreeing that the past couple months have had a good amount of adventure games. Until Dawn! PS Plus has had some big titles lately! Until Dawn is a fantastic game. Tell Tale GoTs is really good. Last time I tallied it I think for 10 months we had like 7 or 8 retail games. Now are on like 12 months and 10 retail games or something. We have been having a lot more retail games than people give Sony credit for, but they need to drop PS3 support to be honest. Sony is like 20 million units of PS4 under PS3 users. I don’t wanna say they should drop Vita PS Plus as well but to be honest they’ve given away almost all the good cross-buy games and most of the good games on Vita. It’s getting to the point to where all people care about is the PS4 games and that the other 2 platforms are holding them back. plus they could still round out the last few cross-buy games on plus and give us the better ones they are holding out on, but… pretty much every good game has either been around $5, is a JRPG, or has been given away by plus. They probably still got a lot of people on those platforms. I myself get at least one of the PS3 or VITA a month. What’s with people saying they should drop the PS3 and Vita offerings? A lot of us still have PS3s, and personally, I look forward to the Vita games every month at least as much as the PS4 ones. It’s not entirely fair to compare the offerings for different regions either; the licenses and permissions would be different due to the localizations, etc, so Sony might be able to arrange for one region’s version of a game but not another’s. I’d love to see Gravity Rush on PS4 offered here too, but you don’t see me ranting and raving about it…. No one is obligated to like every month’s games, but hey, they’re trying. There’ve been some good ones lately, including this month. Until Dawn is awesome!! I already Have a Physical copy though. Never Played GOT but Will give it a look. The people complaining about Japan having better games , Just make a Japan Account!! My friend did it months back, Japan Actually gave away Until DAWN and a few others like 3 Months Ago I remember right.. There a lot better than the games we have been getting! Killing floor 2? I played the Beta on Console like a month n half ago when so I was def happy to see it this month. Life is strange was also a decent game, It’s not really my type of game but I still played it and was surprised how decent it was. I watched my GF play through most but it was still fun arguing over what decision we should choose. I would love to see them just always put awesome tittles on Plus, But no matter what Not everyone is going to like certain games,Just nothing we/they can do about that. Unless they were to setup 2 Poles with a List of certain games and whichever gets the most votes on each Poles games That be the tittles they put out for that Month.. Would be Nice to have more say so over your PS choices but Doubt that would ever happen..
Is there any chance Until Dawn will have the bonus pre-order content? No, these always just include the base game. Out of curiosity, what was the pre-order content? It was an extra chapter with Matt & Emily that added a little bit more to the story – nothing major, but it would have been good to play it. The digital version already includes the Matt and Emily chapter, I bought the digital version last year and it had it, it says it on the Store description. If you think about it, they are both survival horror games. Great month to own a PlayStation. Unless you don’t like Survival Horror … in which case its a “Meh” month (but hey, that GoT game looks interesting). This is definitely the best offering in a loooong time, it’s just too bad I already own Until Dawn. I’ll probably download it just so I don’t have to use the disc. I also haven’t watched much of GoT lol so I wouldn’t play that game yet. I was always intrigued by Tokyo Jungle, and maybe that Element4l game will be fun on Vita. I bought it for $15 bucks, loaned it to someone, never really asked for it back, it was still in the shrink wrap. I might need to download the companion app and play it while my wife does what ever that app does. Was thinking about rebuying it, so that Rush of Blood makes more sense, but… well… Hey now. The telltale game of thrones shouldn’t have too many spoilers. Not sure though. The Companion app someone mention is for Sony’s Headphones. Like the Sony Gold,Sony PULSE,And Sony Platinum. The companion app is only for SONY PS headsets. This month and Julys r for sure the best Line up I have seen in a while.. Hope they keep it up. UNTIL DAWN IS A GREAT GAME! I think it still goes for 19.99 , Its really good! I have it on Disc, But may will still add it just to have as a backup on digital. I have not watched much of GoT either but I’m still going to check out the game. Lets hope Sony keeps it up! It would be nice if they would make a Poll with a list of games each month and let the PPL Vote on them and which ever 2 games get the most votes that will be the releases for the coming month.. Give us more of a hand in our game choices, Doubt it will happen b ut would be nice. I still use my PS3,So do MANY MANY others and Sony knows it thats why they still release ps+ games and updates to ps3. I normally download 1 of the ps3 games they offer. Keep it up, playstation. Keep it up. I agree and I don’t own a Xbox one. Even thought I have played the ps4 games before I would much rather have those than have 5 or 6 year old games from games with gold. Yes to Until Dawn. Hoping Game Of Thrones is the Telltale game and not the other one. Element4L: Never heard of it. Don’t Die Mr.Robot….difficult I have heard. Tokyo Jungle was never free on PlayStation Plus.. If you would just take the time to read the article instead of just the list by itself…. Also, the other one wasn’t on PS4. Misread Tokyo Jungle, I always thought it was PS+ in 2010 or 2011. Yeah, just saw that it a Telltale Game. Thankfully that other GOT game only stayed on PS3. WOW.. Great Month!! I already own both Until Dawn & Game of Thrones, but for those of you that dont, you are in for a treat!! Super Easy Platinums as well..
Those Vita games, as always, look like the most generic Indie BS that I’ve ever seen. TERRIBLE but normal. The rest of the lineup, especially on PS4, looks great though! Not bad at all! Not “Plus Japan” levels of awesome, but very solid selection right there! And I forgot about That’s You, the bonus PlayLink game. Even better! Wow amazing games already have u til dawn and it’s great love how some people will get the chance to try it. Game of thrones is good for some trophies. That is like three or four months now that PlayStation Plus has had great lineups. Until Dawn is one of the best games on PS4 and Game of Thrones ain’t bad either. Tokyo Jungle was a hidden gem on PS3. Keep this up PlayStation Plus team. Great month for PS Plus, been meaning to try out Until Dawn. And with GoTs new season almost upon us, they hit the nail on the head! I’ve only played the first episode, looking forward to the entire season. Damn, I bought Until Dawn some weeks ago. Anyhow, glad to get the Game of Thrones that I couldn’t finish when my PS3 stopped working. So far every month, the titles offered, I already own. I know a lot of people that are in the same boat as me. I’m wondering if Sony has every considered an alternative for those that already own the titles. Maybe a selection from 2 other games becomes available once their service register that you already own the main titles being offered. Or, convert the dollar amount to Sony points……I don’t know, something. That would be nice. I’ve already owned at least one out of the two PS4 games offered the last few months. Well that’s somewhat disappointing. Two games with cinematic focus over gameplay. I do love the telltale games n all, but releasing it right next to the likes of Until Dawn makes this for a very boring month imo. When comparing the lineup to Japan, it’s no wonder there is so many salty individuals. Until Down Includes Rush of Blood for VR? That is a separate game so no. Well, now that I know what the Plus games are going to be next month, it’s time to hit that summer sale! Meh. I like gameplay, not button prompt interactive games that play themselves. Wth? Japan got Killzone Shadowfall and Gravity Rush remastered. Why do we always get “interactive story” crap EVERY SINGLE MONTH??? Another month of Ps4 games that i already own. The Vita games have dropped off a cliff though, which is a shame. Yhea Good games, at least for ps4. But please, Sony, think also about those people who continue to be subscribed to ps plus service but don’t have alredy ps4. We asks some good games also for ps3 and ps vita, yhea it still exists. I already own both Game of Thrones and Until Dawn, but this is probably the strongest lineup in a very long time, even stronger than last month. Only the silliest of children could possibly have anything to complain about this month. I hope PS+ not being a barrage of indie titles no one cares about continues. I’m very excited about Until Dawn. I gave it a rental playthrough when it came out and always wanted to play it again. I have played GoT, but I love TTG games so I’ll give it another go too. Another good month in my opinion. What about a good R.P.G. for once in my life. Come on with it already!!! Sony blessed my bday with two great games (cause they are easy to platinum). This is the first time plus was better than games with gold this year. Awesome, another month of “No games worth even putting in the library” for me. I don’t survival-horror, I have no interest in Game of Thrones, I don’t own a 3 or Vita, and I looked at gameplay vids for the cross-buy title, and it looks like a flash “stay alive as long as possible” game that, while looking better than anything I could make, looks like something I could have at least made a prototype for in my “Intro to Game Development” class (a 100 level Computer Science University course) when they were still using Game Maker 8. I played the Ranger on the radio in Until Dawn and the guy that gets eaten at the end of the credits (in one of the endings, not really a spoiler). Super fun game! Everyone should check it out. Tokyo Jungle has never been free on Plus. Not sure what you are talking about. Mmmmmm Darkstalkers Resurrection =) . Would have preferred Japan’s lineup in all honesty. Especially because I already own these games and get literally nothing out of it this month, just like last month. Really nice line up! I own both until dawn and GOT, but I am not sad or mad. Finally appreciate attention and respect towards US playstation players! Both games are great! Loved them. Secret(True) ending of Until Dawn was shocking for me, truly didn’t expected. Why can’t we get the same games as japan though? To be honest, these games are kinda “crappy” compared to the japanese lineup. I’m a little salty that I already own the game of thrones TT game. It’s a fantastic game, and has nothing to do with the main story line. It’s about House Forester and it helps to have watched the show or read the books but because you’re not representing house stark, anyone should be able to jump into this game. PS store has exclusive “PLUS” stuff for free.